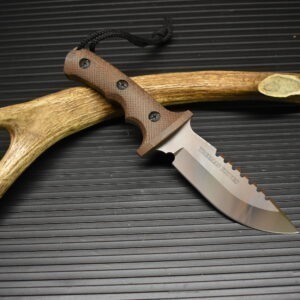 Jim Behring makes his Treeman Knives in his home shop in Michigan. Jim has been making knives since 1998 and established a well deserved reputation for the quality of his work. I have met Jim several times at the Blade Show and bought, sold and traded with him. He has been the subject of several articles in knife magazines for his work and knives he made for Navy SEALS, Spec Ops and outdoorsmen. Jim is an outstanding knife maker.